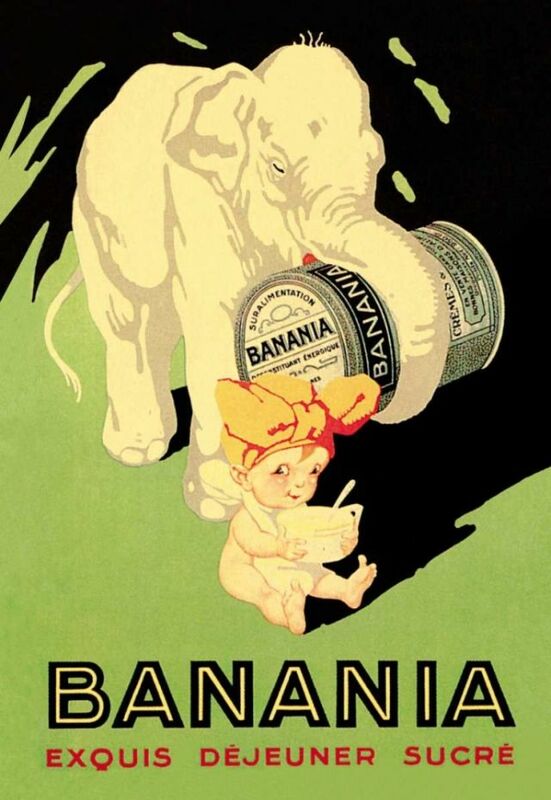 During a visit near Lake Managua, Nicaragua in 1909, the journalist Pierre Lardet discovered the recipe for a cocoa-based drink. 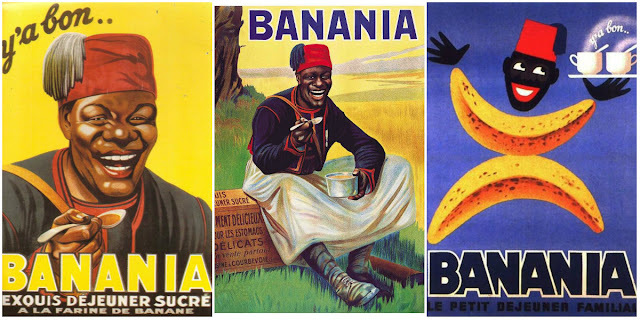 When he returned to Paris, he started its commercial fabrication and, in 1912, began marketing Banania with the picture of an Antillaise. 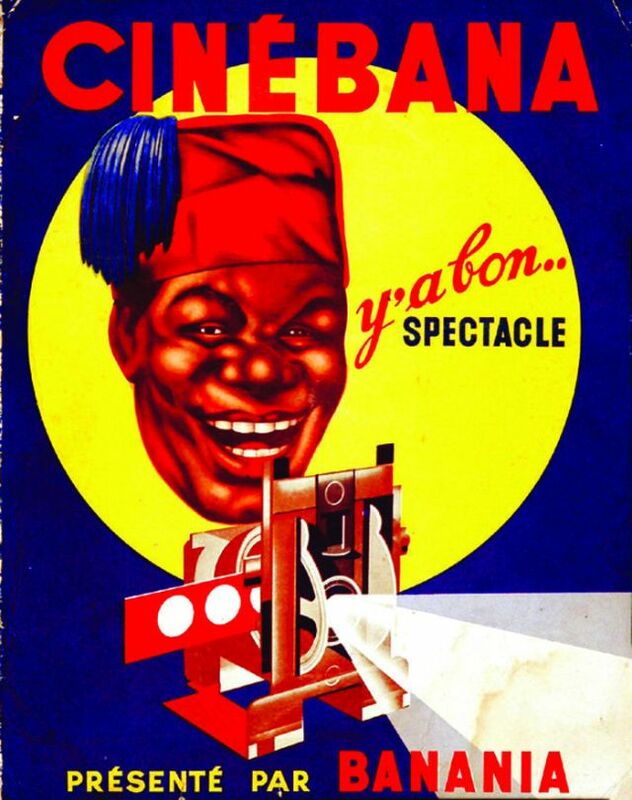 Her image was replaced in 1915 with the drawing of a widely smiling Senegalese man. 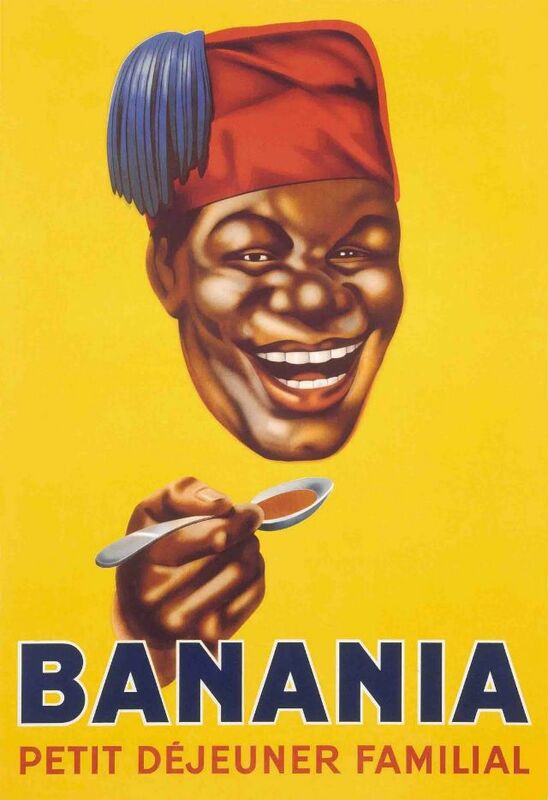 At the outset of World War I, the popularity of the colonial troops at the time led to the replacement of the West Indian by the now more familiar jolly Senegalese infantry man enjoying Banania. 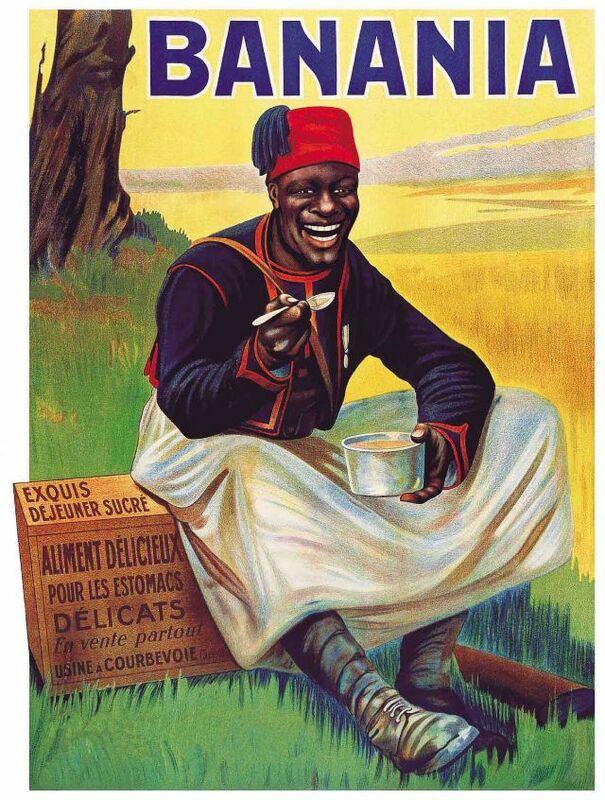 Pierre Lardet took it upon himself to distribute the product to the Army, using the line pour nos soldats la nourriture abondante qui se conserve sous le moindre volume possible (“for our soldiers: the abundant food which keeps, using the least possible space”). 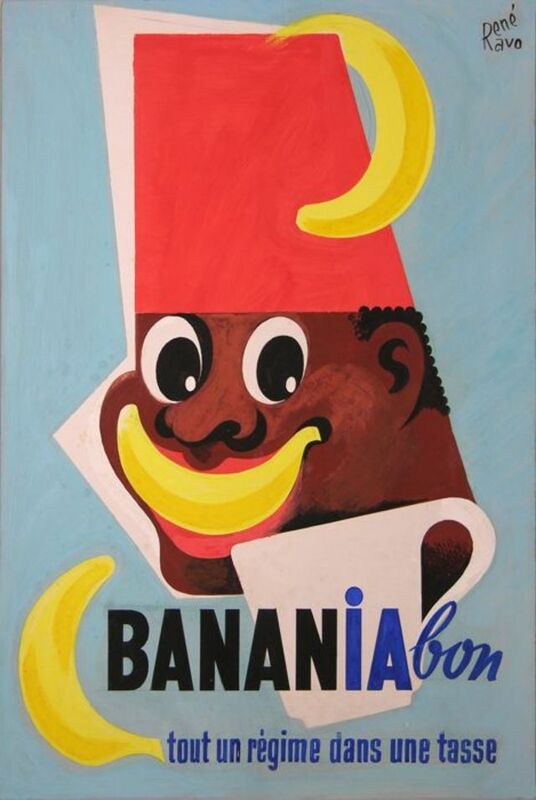 The brand’s yellow background underlines the banana ingredient, and the Senagalese infantryman’s red and blue uniform make up the other two main colors. 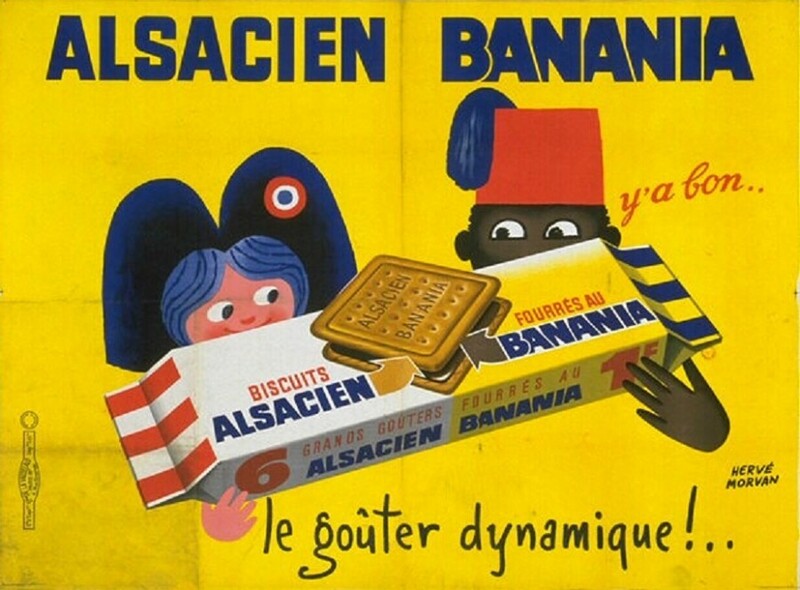 The slogan Y’a bon (“It’s good”) derives from the pidgin French supposedly used by these soldiers (it is, in fact, an invention). 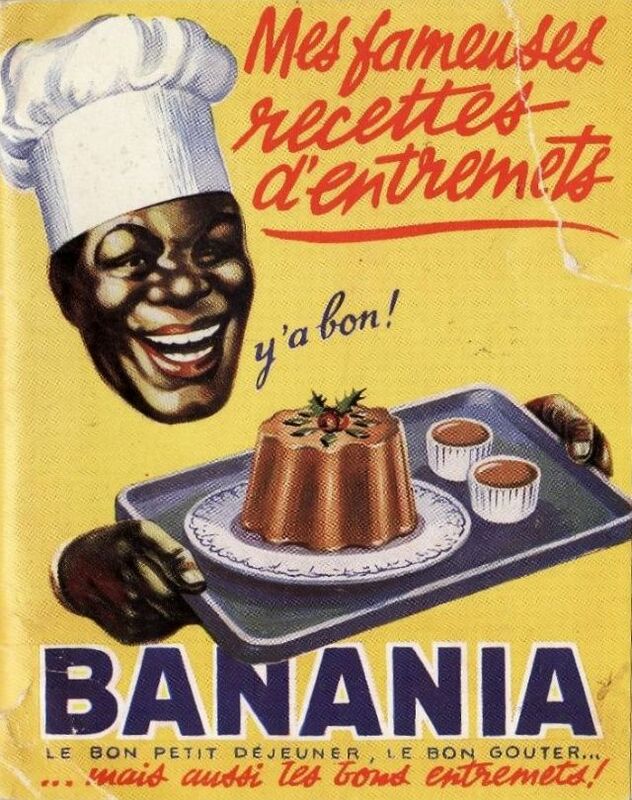 Slowly but surely, the slogan and the character became inseparable as the expression was coined: l’ami y’a bon (“the y’a bon buddy”). 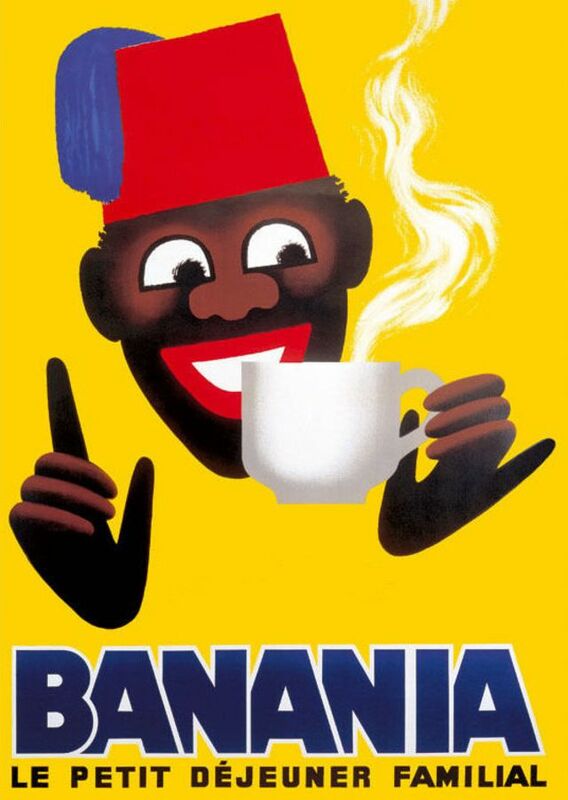 “The brand conveys a pejorative, degrading and racist image towards people of black color whom it portrays as ill-educated, inarticulate and barely able to string together three words of French,” according to the writ from the Collective of Caribbeans, Guyanese and Réunionnais. 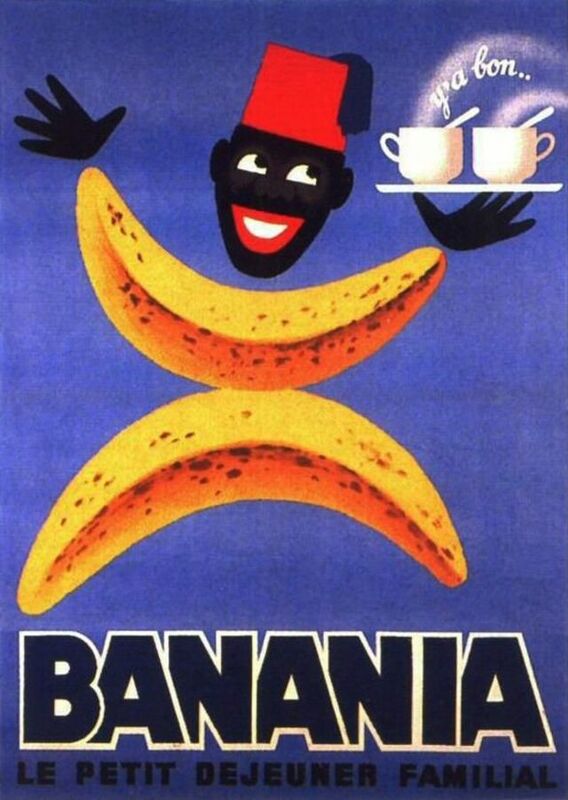 “Use of the slogan since early in the last century has been so influential that some people now associate Banania with skin color. 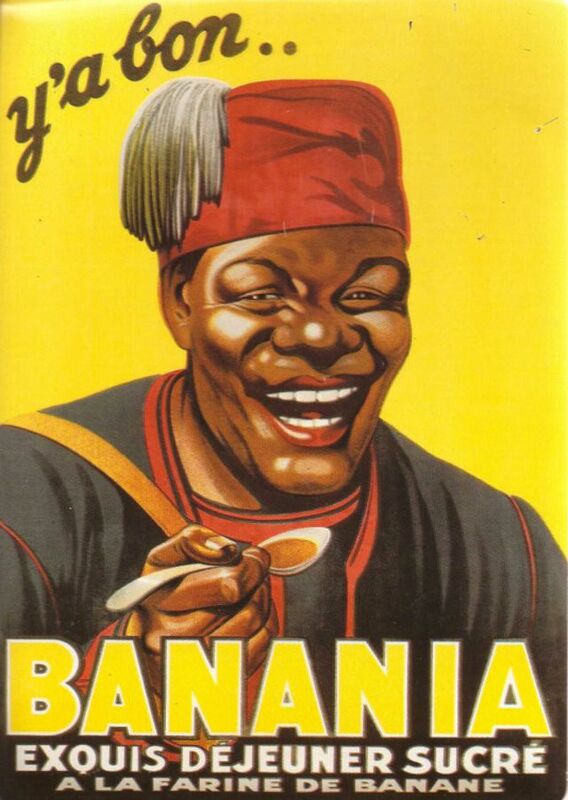 This deplorable caricature has led to hurtful insults against black children in schools and in the street,” it said. 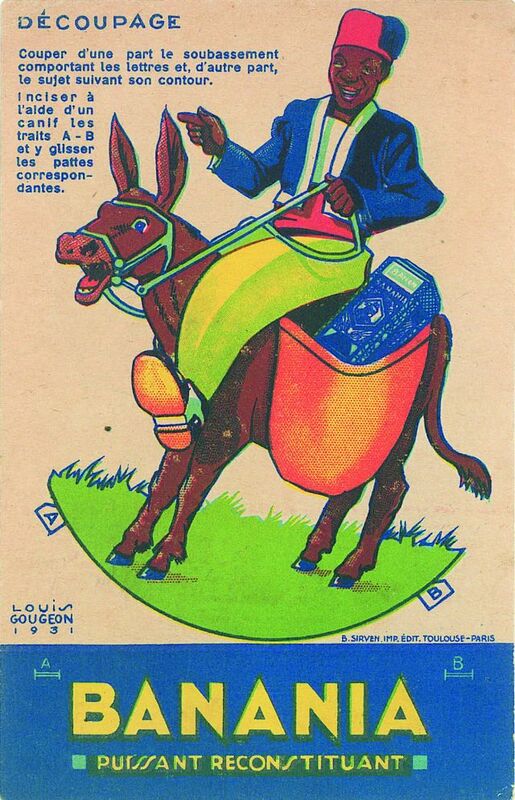 The form of the character has since evolved to more of a cartoon character. However, the original advertising has become a cultural icon in France. 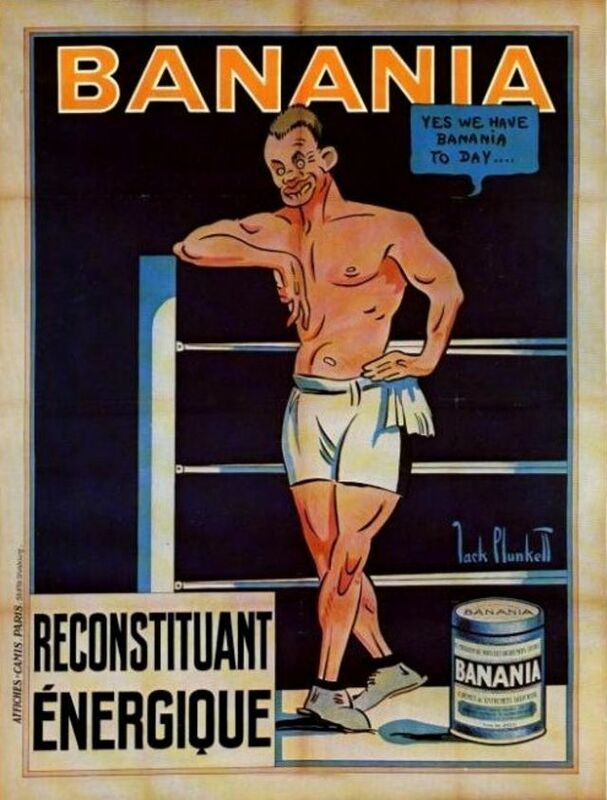 Posters and reproduction tin-plate signs of the pre-war advertising continue to be sold. 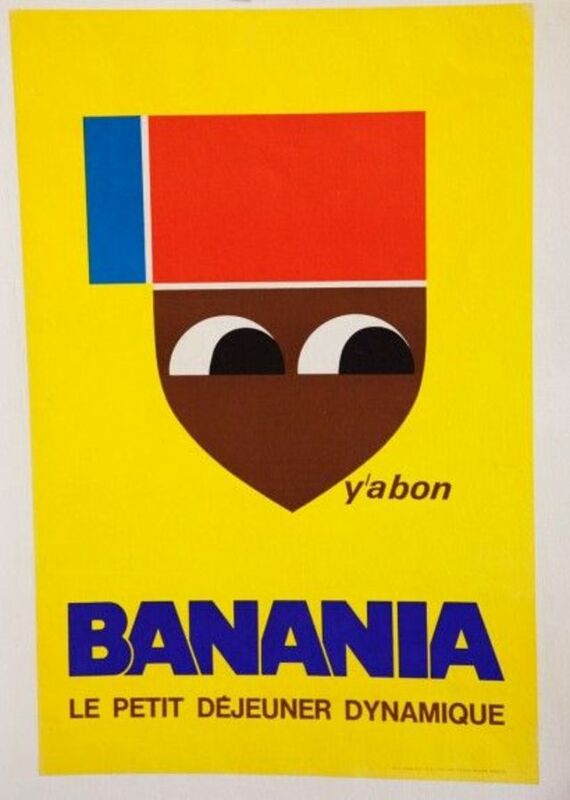 In the 1970s and early 1980s, Banania sponsored the Yellow Jersey of the Tour de France. In France the Banania brand is now owned by the newly founded French company Nutrial, which acquired it from Unilever in 2003. 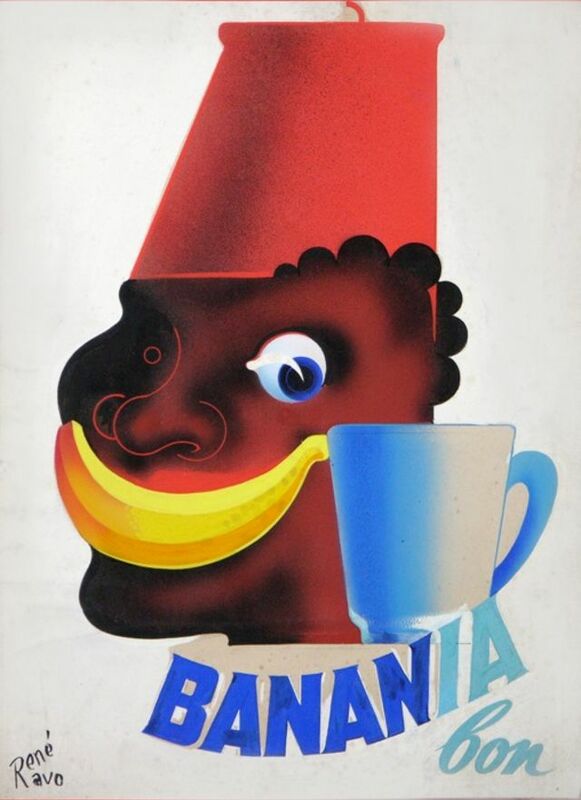 Vintage Banania advertisements, boxes and crockery are today highly prized by collectors.